Author(s) or Studio(s) Nathan Trebes Length in Minutes 3 Published Online 2006-03-21 15:36:15 “Kill the Hearts, Kill them all!” Peter McGrogan establishes this Valentines Lan Party Movie with true LAN Style. The LAN features Steve McGrogan, David McGrogan, Mark Lockyer, Kyle Strand, Patrick and more! Produced by Nathan Trebes. 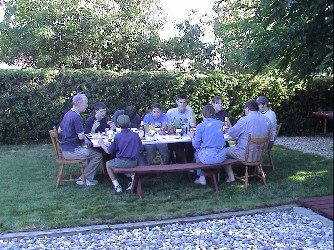 The McGrogans, Mark Lockyer, and the Wyse’s came over for 4th of July dinner! Then we all went over to OSLS Field to watch the fireworks. There we were joined by Matt and his dad. To see pics from this cool evening, Click Here.